Tom Poholsky had a remarkable performance against the Dodgers on Aug. 3, 1956, at Ebbets Field in Brooklyn. The Cardinals pitcher gave up 14 hits, all singles, and managed to avoid getting a loss. The latter was no small feat. Ebbets Field was a house of horrors for Poholsky. His career record against the Dodgers at Brooklyn: 0-11 with a 5.72 ERA. Ten of those losses were as a Cardinal, one as a Cub. Poholsky, who pitched five years (1950-51, 1954-56) for the Cardinals and one (1957) for the Cubs, was 4-17 overall against the Dodgers. As a Cardinal, he was 4-15 versus the Dodgers. In 1956, Poholsky, 26, a right-hander, was one of the Cardinals’ top starters. He ranked second on the staff in starts (29) and innings pitched (203). On Aug. 3, he appeared headed for a win at Brooklyn. The Cardinals led, 8-2, after five innings, but the Dodgers kept piling up singles against Poholsky. Jackie Robinson had three. Carl Furillo, Jim Gilliam, Gil Hodges and Duke Snider had two apiece. Sandy Amoros, Roy Campanella and Randy Jackson had one each. Poholsky also unleashed two wild pitches, but he protected the lead, in part, because the Dodgers hit into three double plays against him. When Poholsky was relieved by Larry Jackson, with one on and one out in the seventh, the Cardinals led, 8-4. Jackson gave up a home run to the first batter he faced, Hodges, narrowing the margin to 8-6, and the Dodgers scored twice more in the eighth, tying the score at 8-8. Poholsky’s line: 6.1 innings, 14 singles, 5 runs, 3 walks, 4 strikeouts, 2 wild pitches. The Cardinals prevailed because their third pitcher of the game, left-hander Jackie Collum, held the Dodgers scoreless for 4.1 innings in relief of Jackson. Collum yielded one hit, a single by Campanella. Fifty-eight years later, May 9, 2014, the Mariners’ Brandon Maurer became the first pitcher since Poholsky to yield 14 hits in a game, with all being singles, ESPN.com reported. Unlike Poholsky, Maurer was the losing pitcher. The Royals beat the Mariners, 6-1, at Seattle. The Royals had 16 hits (including two off Tom Wilhelmsen), all singles. Poholsky was 1-5 against the Dodgers in 1956. He pitched a complete-game three-hitter in a 4-1 Cardinals triumph over the Dodgers at St. Louis on May 5. Snider homered, Gilliam tripled and Amoros had the lone single. 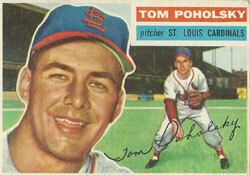 Overall for the 1956 Cardinals, Poholsky was 9-14 with a 3.59 ERA. He was traded to the Cubs in December 1956 and was 1-7 (including two losses to the Cardinals) in his lone season with Chicago.